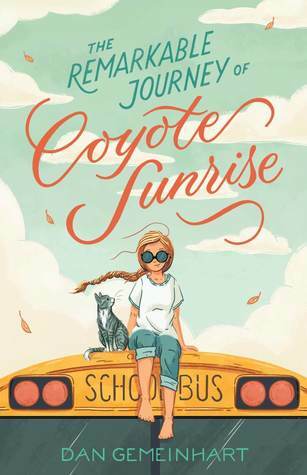 The Remarkable Journey of Coyote Sunrise! This cover caught my eye, when I scrolling through the publisher's catalog, and when I read the synopsis, I knew the universe made me notice it for a reason. My love for grief and loss books is well documented, and I have developed quite an adoration for middle grades this year. 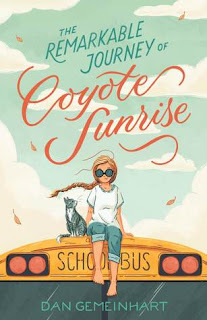 Coyote Sunrise ticks both those boxes, plus the synopsis might have made me a little teary-eyed, and I am all about letting books hit me in the feels. The kid's name is Coyote and her dad is Rodeo. Interesting names usually belong to interesting people. They have been running from their grief for 5 years! That's quite a long time to leave that wound open. I love the idea of meeting all these strangers while on their journey. They sound like a colorful group of characters, each with a story to tell. From that last sentence, I sense this one will leave me with a full heart, and you guys know I love that stuff. MGs does it so well though. It's tender and sweet and honest, but not gut wrenching, and it's always hopeful. I have been loving all the MG books I have read lately. Cute pick! Not my kind of read but I hope you positively love it! The combination of cover and title caught my attention, and the blurb made me add it to my TBR. This sounds like a lovely story - hope you enjoy it! I have a feeling it will leave me smiling. I think the middle grades authors have been killing it this year. They are tackling so meaty topics and doing it so well. I haven't really read much MG. I do like this cover though too! Their names made me smile. I am imagining hippies, and I am eager to learn more about them. This one is completely new to me but I enjoy a good book about grief myself so I will have to keep an eye out for it. The title caught me and when I found out it was a grief and loss book with a 5 year road trip, I was pretty much hooked. Middle grades have been amazing for me lately. I try to read a few every month.